Set your keys apart with an Autism Awareness Keychain that shows Strength, Life, Courage and Love. Each Keychain raises awareness for Autism with its multicolored design and gives support wherever you go. 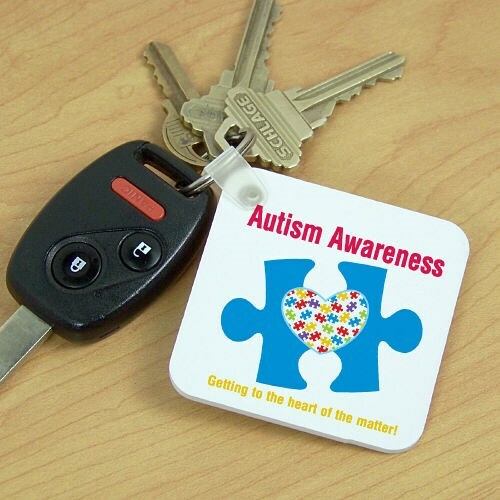 This Awareness Key Chain measures 2 1/4" x 2 1/4" and is 1/8" thick. Your Key Chain is made of fiber glass reinforced plastic and includes a key ring. Additional Info April is Autism Awareness Month. Help make life easier for families who have children with Autism by showing your support with Personalized Autism & Asperger's Awareness Apparel & Walk Gear from MyWalkGear.com. Wearing an Autism Awareness Shirt will help educate everyone about the diversity of the people and families living with this condition. This Autism Team Key Chain is perfect for your next walk event and looks great with our Autism Awareness Long Sleeve Shirt or our Autism Awareness Hooded Sweatshirt.